NASA engineer and physicist Harold White announced a few years ago that he was working on a potentially groundbreaking idea that could allow space travel faster than the speed of light. Space Entrepreneurs began as Pioneers. 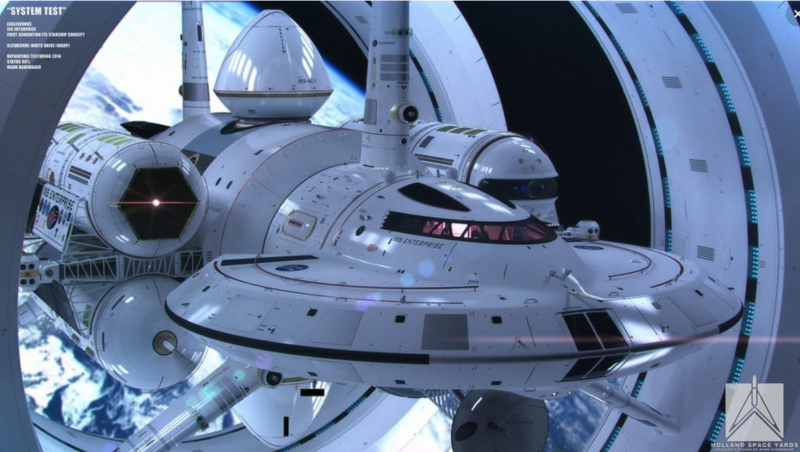 And now, to boldly go where no designer has gone before, Mark Rademaker — who is collaborating with White — has created a CGI design concept for the “warp ship.” They’re calling it the IXS Enterprise. 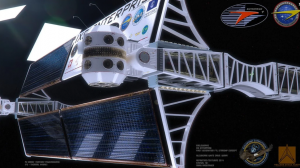 A warp ship such as the IXS Enterprise could allow travel to interstellar space in a matter of weeks rather than, say, centuries. And the science behind why it might be possible is truly mind-boggling. 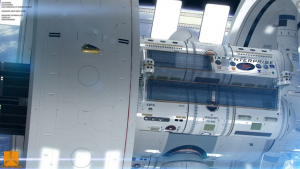 Essentially, the empty space behind a starship would be made to expand rapidly, pushing the craft in a forward direction — passengers would perceive it as movement despite the complete lack of acceleration. White speculates that such a drive could result in “speeds” that could take a spacecraft to Alpha Centauri in a mere two weeks — even though the system is 4.3 light-years away. White, whose title is “Advanced Propulsion Theme Lead for the NASA Engineering Directorate,” has mathematically calculated a plausible way to accomplish this using far less energy than required by the original theory, which was proposed in 1994 by physicist Miguel Alcubierre. 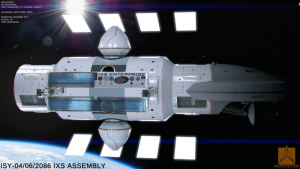 His concept requires using large rings that surround the spacecraft (which you can see in the image above) to greatly reduce the amount of energy needed to warp space-time in front of and behind the spacecraft. Harold White and his team at NASA’s Eagleworks Labs are now working to create a “proof of concept” for this idea. What White is waiting for is existence of proof — what he’s calling a “Chicago Pile” moment — a reference to a great practical example. 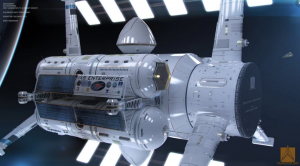 Faster than Light — Warp Drive — Is it possible to travel faster than light? NASA’s Advanced Propulsion Lead, Dr. Harold White, has modified a previously unsuccessful FTL model called the Alcubbierre Drive and has successfully proven that faster than light travel might just be possible. Join Dr. White to discuss the hard facts behind this technology as well as roadblocks to exploring our closest stars. 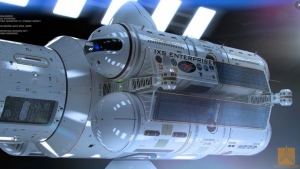 Original article: This is the amazing design for NASA’s Star Trek-style space ship, the IXS Enterprise | Washington Post | Abby Phillip was a national political reporter covering the White House for The Washington Post. She left The Post in October 2017. Permission for images, by Mark Rademaker, pending. Star Trek-Style Space Ship. Engineer an Enterprise like in “Star Trek."